Not everyone is a Tom Brady fan. However, most people would agree with the message to never let haters get you down. Same goes for parenting. We all need to be a little more kind to one another and how others choose to raise their kids. “Sometimes you find pure love by accident. Charlene came into my life 13 years ago when I began to date her mother. When I first laid eyes on her, I was in love instantly. Her father wasn’t in her life and still to some degree not. I ended up marrying Charlene’s mother 10 years ago and helped raise her as if she was biologically my own. Most of the time, when you hear the word “dingo,” it’s tongue in cheek. Thanks to a Meryl Streep movie back in the 80s, and Elaine using that movie’s signature line on an episode of Seinfeld, the Australian prairie dogs have been reduced to the infamous “a dingo ate my baby” punchline. Except for the Meryl Streep movie, A Cry in the Dark, was based on a true story about a woman whose baby was stolen by a dingo. It seems far fetched, particularly to anyone outside of Australia who’s unfamiliar with the animal. But a new story is putting the fear back in the dingo. A couple was vacationing at Euron Beach on Fraser Island, Australia with their 4-year-old daughter and baby son when they were awoken by the sound of their 14-month-old screaming. They noticed that the screams were growing more distant, and upon leaving their trailer, the boy’s father realized a wild dog had snatched their son and was dragging him off. “He was apparently grabbed around the back of the neck area and dragged away,” the Lifeflight pilot who also answered the call told Australia’s Courier Mail. The little boy was left with a fractured skull and puncture wounds to his head and neck, but things could have been much worse. “If it wasn’t for the parents fighting off the dingo he could have had much more severe injuries,” Frank Bertoli said. It was the pilot’s third dingo rescue over the past few months. They’re not so funny anymore. Becoming a parent for the first time can be a daunting endeavor. 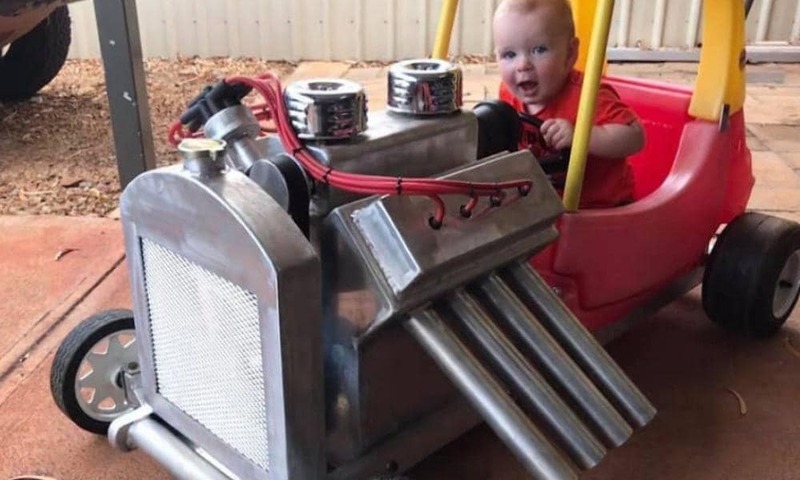 There’s a nursery to prepare, cabinets that need baby-proofing, and most importantly – there’s a tiny custom hot rod that needs fabricating. If that last one didn’t make your list, then you’re not Ryan Evans. Ryan, who along with his wife Bianca were expecting their first child, wanted to create something truly special for their first born. The couple chose not to find out if they were having a boy or a girl, so exactly what that gift would be was initially undecided. As the pregnancy progressed, Ryan began searching the internet for ideas and eventually, as Bianca recently told Australia’s Kidspot, he found the perfect project. While most of us are familiar with the iconic red and yellow plastic automobiles, (there’s even a drivable adult version!) you may be surprised to learn it’s one of the few plastic children’s toys actually produced in the US. While they’re made from recyclable plastic, most are instead handed down through many young drivers before ever being retired. When the Evans’ eventually welcomed a son into the world, Ryan began planning and designing what would become known as “Josh’s Rod” in the family’s garage. After carefully choosing the right vintage (pre-enjoyed) model and planning out all the details, Ryan spent the next several months crafting and perfecting this fully custom, one-of-a-kind roadster. 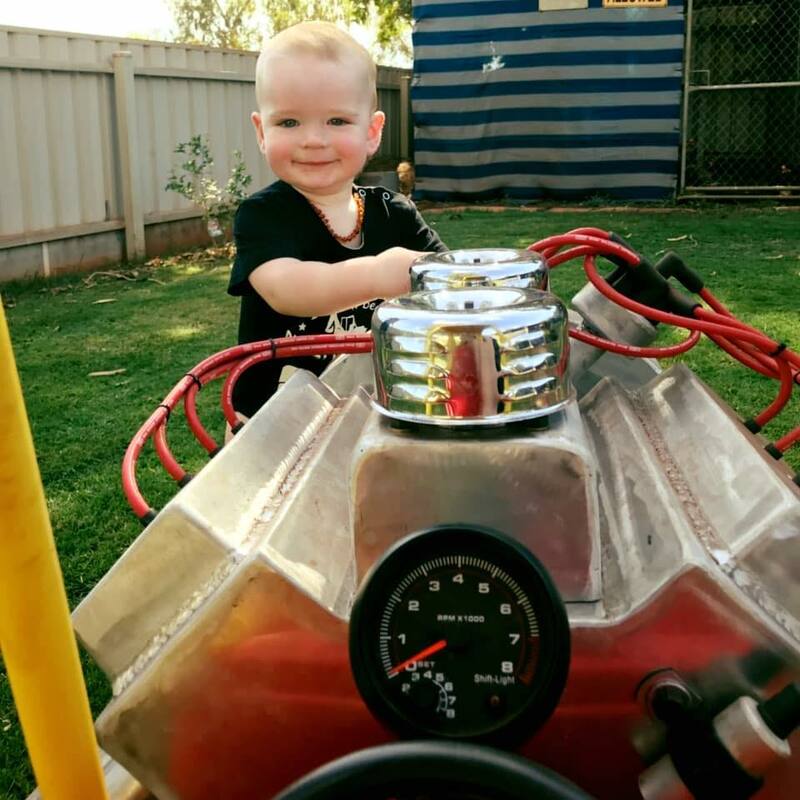 Josh’s Rod comes complete with a pretend – but still very boss looking – motor, radiator, custom chassis, and even real spark plug leads, hopefully allowing the youngster get an early appreciation for proper automotive maintenance. As for Josh, he’s already speeding around town and loving every minute of it. 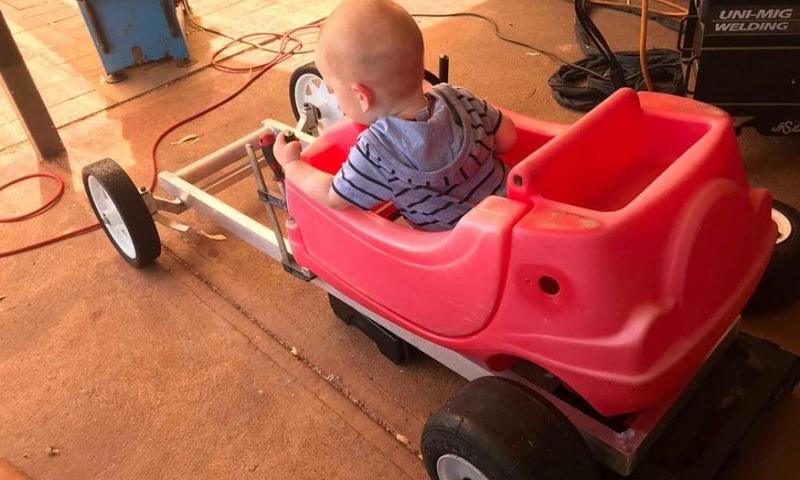 “He has been out watching dad build it and sitting in it for a long time, so to see him enjoy the finished product was a really proud moment.” Bianca told Kidspot. “We live in a small town, so it’s a five minute walk to the shops and he wants to be in the hot rod wherever we go,” she added. The couple’s hope is that even after Joshua outgrows the custom cozy coupe, they will keep it for the next generation to be able to enjoy. Avengers: Endgame, the most hotly anticipated superhero film in history, is right around the corner and everyone is losing their damn minds (myself included). But if you think this means Marvel is going to stop injecting our excited little nerd brains with comic book-based, dopamine-inducing content, think again. On Monday, Marvel coyly tweeted out a thread of every post-credits scene from its 21 previous movies, taking all of us on a much-needed mini-voyage through the MCU. Starting all the way back from Nick Fury’s iconic “You think you’re the only superhero in the world?” line at the end of 2008’s Iron Man, it’s a perfect nostalgia-packed appetizer before the Hulk-sized main course this weekend. Often times, pranks can go too far and just end up coming across as stupid or mean. This is not a story about one of those pranks. The Ferry brothers—Chris Jr and Mike—are lifelong pranksters, but of the wholesome variety. For years, they’ve loved to surprise their dad by telling restaurant servers it’s his birthday (especially when it wasn’t). “It was always the greatest for us to see the expression on his face when they came out with a lighted birthday cake and singing happy birthday in front of all the other hockey dads,” Chris Jr. wrote on Facebook. This year, however, they decided to go all out. 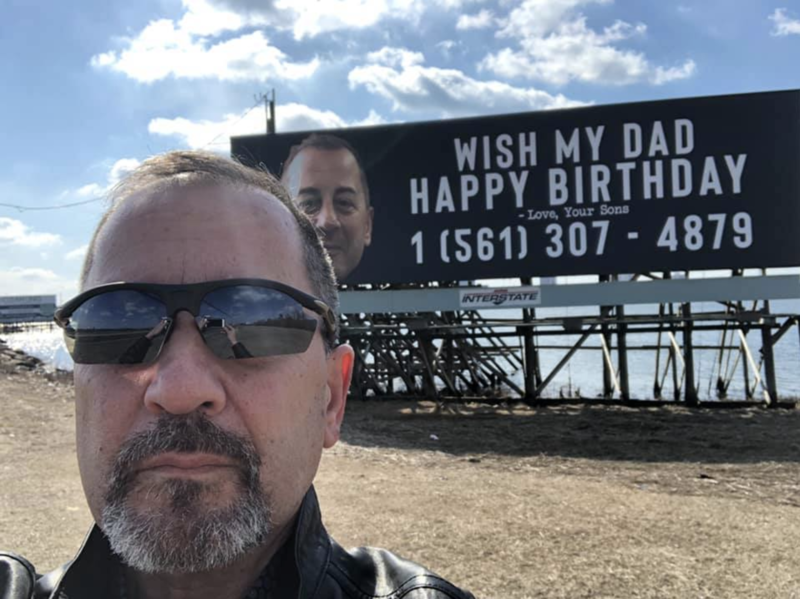 In lieu of servers singing non-copyright versions of ‘Happy Birthday,’ the brothers rented out a billboard in Atlantic City that simply read, “WISH MY DAD HAPPY BIRTHDAY – Love, Your Sons,” and included their dad’s picture and phone number. “We just wanted him to have a special birthday. That’s it,” Chris Jr. said. Well, it turns out people definitely still pay attention to those big roadside signs because, according to NJ.com, Chris Sr. received an estimated 250,000 happy birthday phone calls and text messages from all around the world. Overwhelmed—both emotionally and technologically—Chris Sr. decided the only proper response was a page straight out of his sons’ playbook. Powerful words considering how if any of us received even a fraction of that many text messages in a day, we’d undoubtedly want to chuck our phones into space. Considering how long our current generation of consoles has lasted, we all knew the next group of gaming machines was bound to be around the corner. Sony has revealed preliminary details of the 5th generation of PlayStation consoles (which we will be calling the PlayStation 5 for the time being, despite the actual name not yet being announced). When it comes to system specs, players can expect an upgraded CPU and GPU as well as a significant increase in the size and speed of system memory. Another aspect that Cerny really hammered home was the new “3D audio” feature and how it is redefining gaming. This effect will require no new hardware and will allow players to experience much more immersive gameplay, with sounds coming at you from above, behind, and each side. 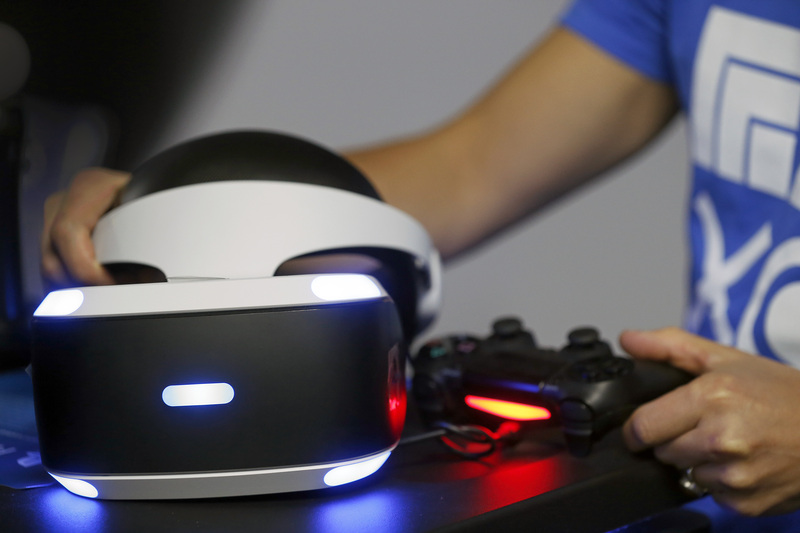 When asked about PlayStation VR, Cerny said Sony definitely has plans to explore much further into the VR space. Cerny also talked about the special solid-state drive (SSD) system that will shorten loading and processing speeds exponentially. When comparing load times for Marvel’s Spider-Man on the PS4 to the same game on the PS5, a fast travel sequence was shortened from 15 seconds to an astonishing 0.8 seconds. The new system will still play physical copies of games and will also be backward compatible with PS4 games. No official word yet if games from earlier generations will be playable though, but Sony did file a backward compatibility patent and that might mean it would cover all generations! 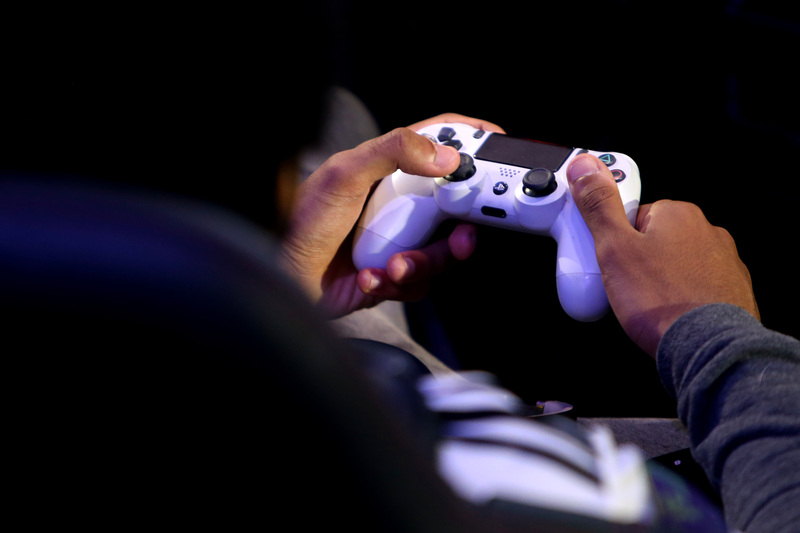 No word yet regarding an actual release date for the still unnamed system, and given that Sony will not hold a keynote conference at E3 for the first time this year, it’s unlikely the gaming conference will yield much new information either. If it sees the light of day in 2019, we will be shocked. But take your time, Sony. We still have a few games to keep us busy while you develop total gaming Nirvana. We can wait. Not long ago we shared a story of teenagers coming to the rescue of a little boy who had slipped from a ski lift and was danging over the slopes. They used some quick thinking to rescue the kid and earned praise as heroes. Not there’s another story going around of teenagers helping someone at the other end of the spectrum, an elderly gentleman who had fallen to the ground while walking in Caldwell, Idaho. A car full of teenagers were driving down the street, headed to the court to play some basketball when they saw a man who was making his way down the sidewalk with a walker stumble and fall. Isaac Hernandez was driving the car and when he stopped the man on the ground he quickly stopped the car so he and his friends could check on him. Not only did the five boys help the senior, Jose Garcia, to his feet, they also walked him home and, once there, tended to and cleaned up his scrapes. Erika Tolvar happened to be passing by and she witnessed the whole thing and shared it on Facebook. Erika’s photos caught the attention of the internet, and the local Caldwell community, who responded by lavishing gifts on the boys for their good deed. But they insist that’s not why they helped him. Erika’s Facebook post has been shared nearly 1000 times, but more importantly, Isaac and his buddies have made a new friend. In the aftermath of the incident, they’ve been visiting Mr. Garcia to check in with him, and plan to continue to stop by in the future. How Is James Harden Like A Single Mom? In our first episode of Parenting Lessons Learned From Sports, our hosts Rob and David talk about how they’ve learned parenting lessons from players like James Harden and Chris Paul.